This high-performance shackle consists of a special screw, nut and split pin, which makes losing the screw practically impossible. The wide opening makes this shackle extremely versatile – for instance, it may be used on spreader beams. The clevis system makes linking the shackle to the chain quick and simple, without the need for an additional connecting element. 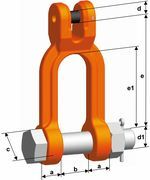 The clevis shackle is manufactured according to EN 1677‑1 with mechanical values for G10, and comes with a full operating manual, BG-approval and CE-marking. Prior to each lifting operation, it must be checked that the safety split pin is in place and that the system is subjected to straight pull only. Lateral forces must not be applied. Assembly must be handled by a competent person. No special tools are required. The KBSW spare parts set consists of coupling pin and retaining pin. The KBMSW spare parts set consists of special screw, nut and split pin.